Civitas seeks to unify a global community of like-minded people whose commitment to sound economic principles will carry the world's next generation into prosperity. To become a member of Civitas, there are no entry or recurring member fees, citizenship requirements, or educational background conditions. For many reasons, people are compartmentalized into social groups by gender, race, religion, educational background, economic status, age, and ethnicity. Examples of our members include a pilot in the U.S., a CEO in Norway, a coffee bean farmer in Rwanda, and a cab driver in Bangladesh. With a collaborative effort and common ground, our vision is for every citizen of the world to financially, socially, and personally thrive, despite the fact that nearly ½ of the world's population lives on less than $2.50 a day. Since people can't pick their parents or their birthplace, Civitas believes in offering those who are apt to become a victim of their circumstances to instead be a product of their choices. Does someone's challenging situation decide their future or can they bring themselves out of a life of poverty? There are billions of people who were born without fortune or health in their favor. These are the types of members who use the majority of Civitas' resources and services. 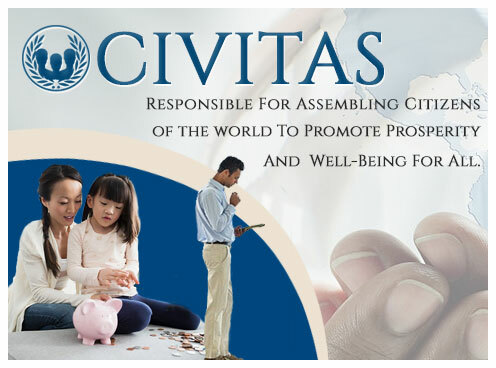 Whether offering online financial products to neglected markets, supplying finance related education to the underprivileged, or implementing mentorship programs for inexperienced entrepreneurs, Civitas' focus is to stop the revolving door usually predestined for the poor and their offspring. It's time to close the gap between those with access to credit and those without.